Glow colored Salty Grubs on a 1/4 oz. leadhead. Hard to beat. Or Reaction Strike Jerk Jr./Norton Sand Eels on a 1/4 oz. leadhead. How come I haven't caught any good fish on those lures that were mentioned??? I have tried every brand and color lure and have yet to catch a speck on one this year. I think that I'm cursed this year! I was throwing a glow Salty Grub on a 1/4 oz. 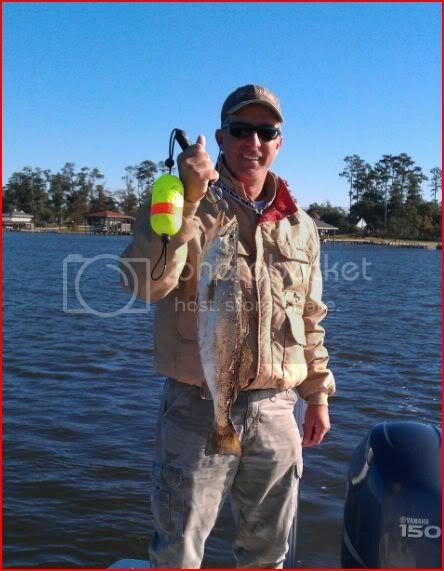 lead head and also a DOA shrimp under a popping cork on Sat., Sun. and Mon. against 4 live bait(shrimp, croaker and mullet) fishermen. I caught the same as one guy on one trip and beat everyone on the other 3 trips. I guess it's how you work it. If they don't hit after 10 or so casts, try a different tactic. Work fast, one twitch at a time. If not catching, double twitch. If still not catching, work slower. If still nothing, change color. Glow is pretty hard to beat.